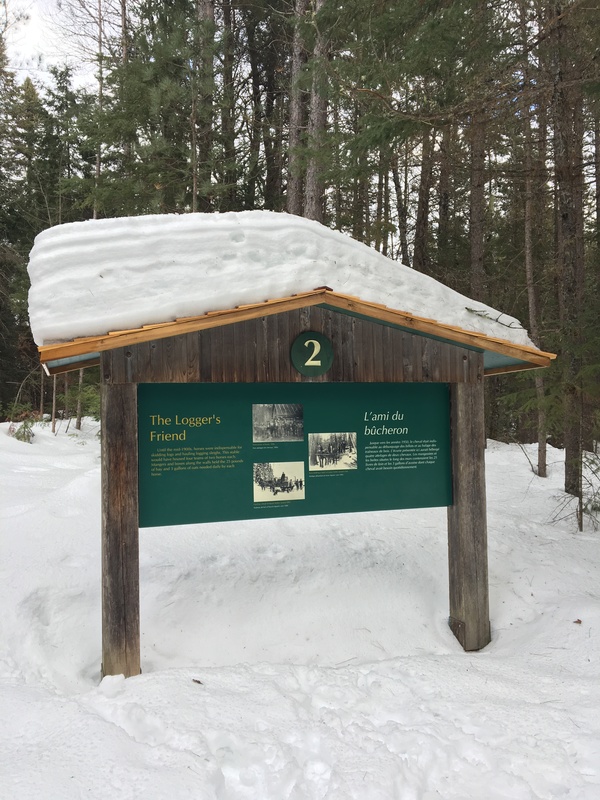 Have you ever been to he Algonquin Logging Museum Trail? 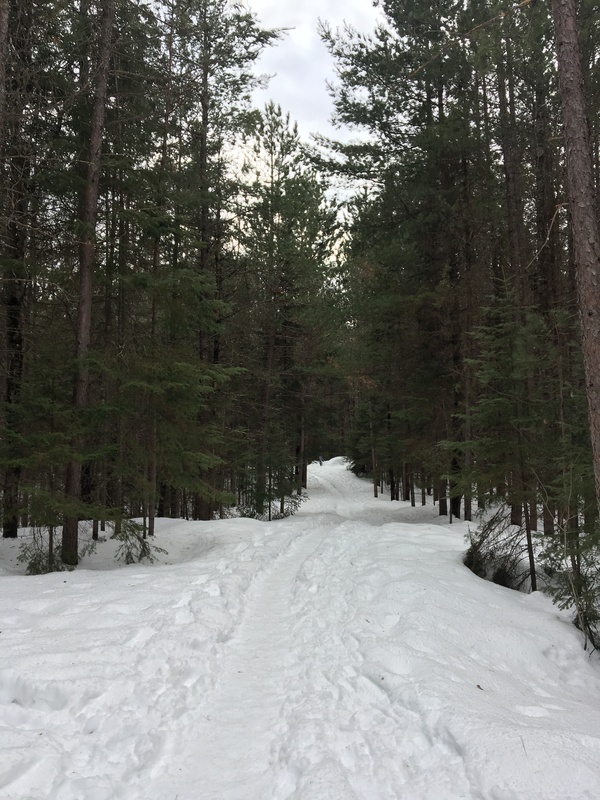 Up until last February, I had never been there and was quite surprised there was a trail in the Park, that I didn’t know about. Of course, had to rectify that quickly. 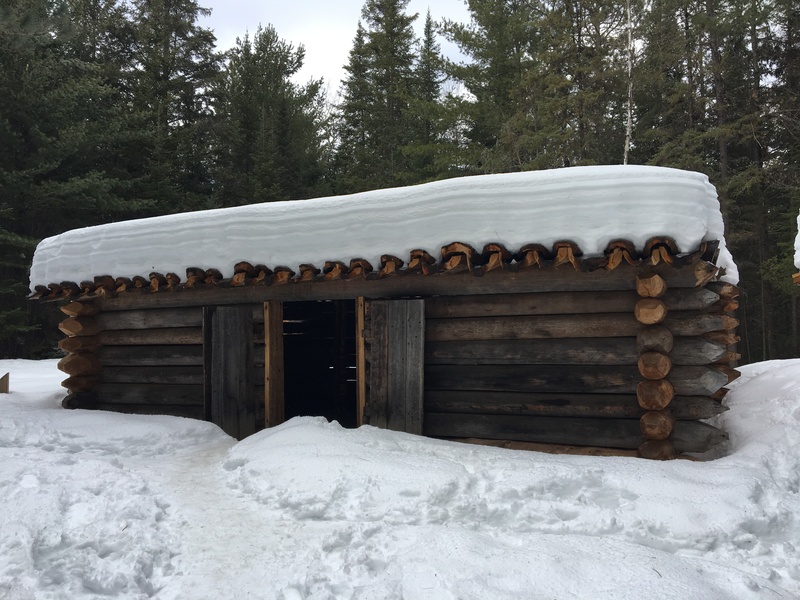 The trail starts off around the side of the actual logging museum, which isn’t open in the winter, unlike the trail. 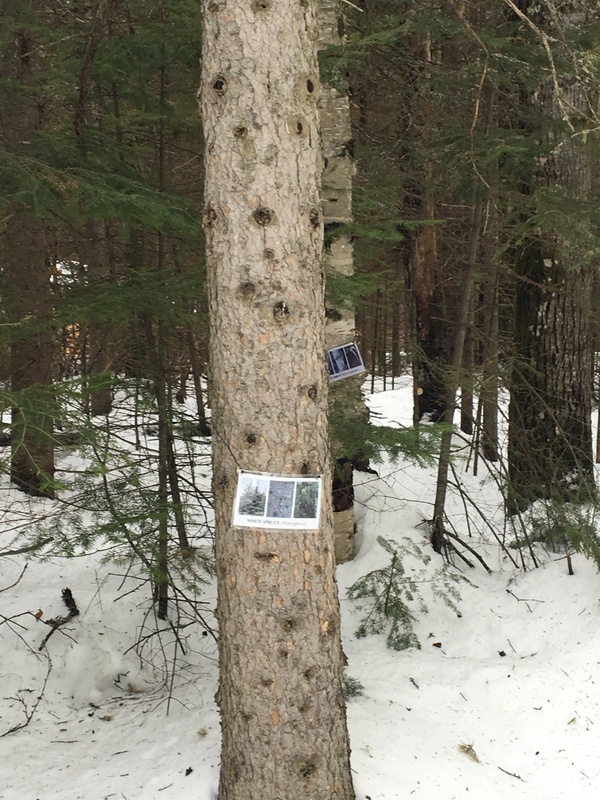 Some of the trees are marked with that types they are, which I thought was really cool, as I could use some work on my tree identification. 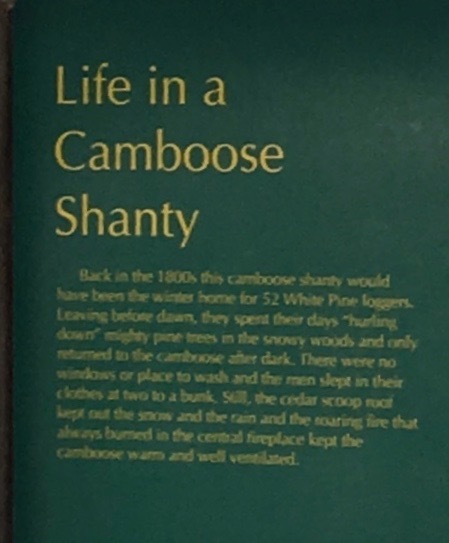 The first thing you come across is a camboose shanty. Each exhibit has write ups with a brief description of what you are looking at etc. Super informative. The loggers friend is the stables where the horses were kept. 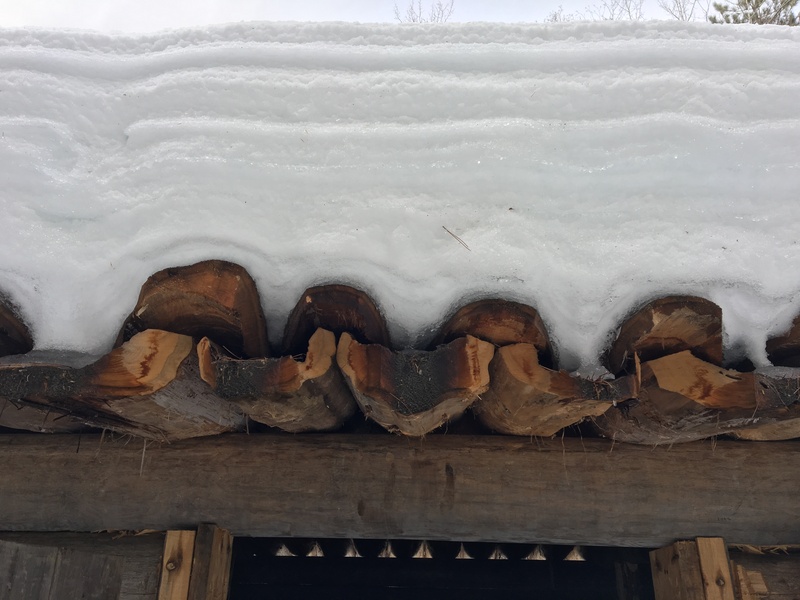 I thought the way the roofing was done was especially cool and you will see below a closeup photo of what I called the eaves troughs. Amazing how clever the building was back then. 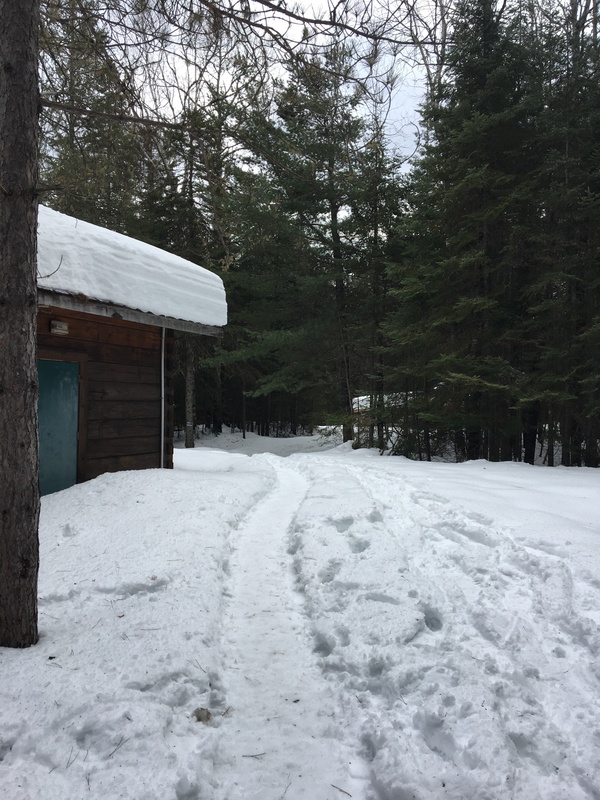 Off we go to explore more exhibits down the snowy trail! 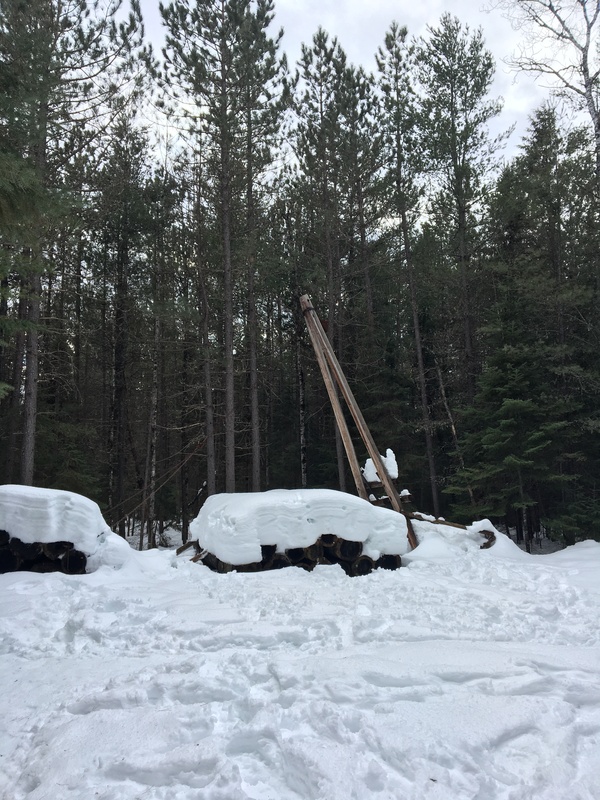 Below is what they used as crane to move logs etc. Unfortunately, you can’t see that much due to the snow, so I will have to come back in the summer for a better look. This was something I thought was extremely interesting. 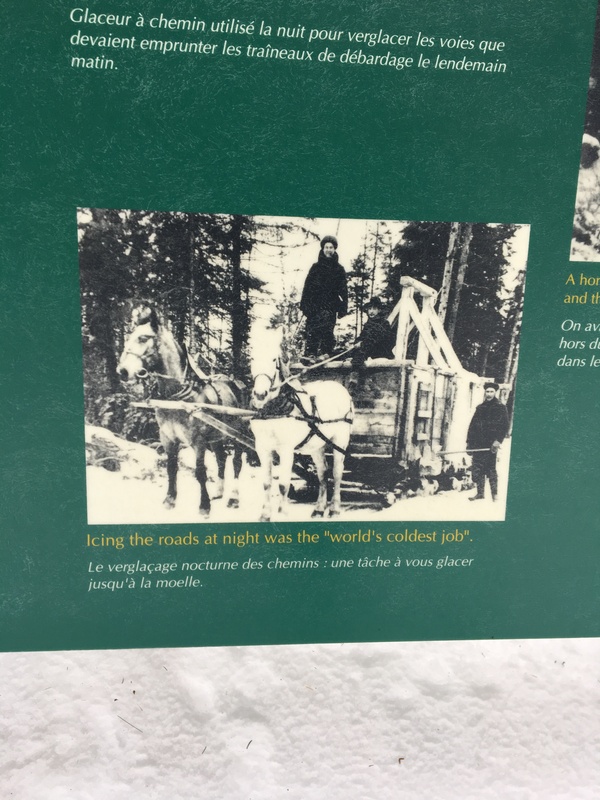 They used the tanker sleigh above to plow and ice the roads so the sleighs could slip down them more easily. Totally ingenious! Above is a photo of the tanker sleigh being used. 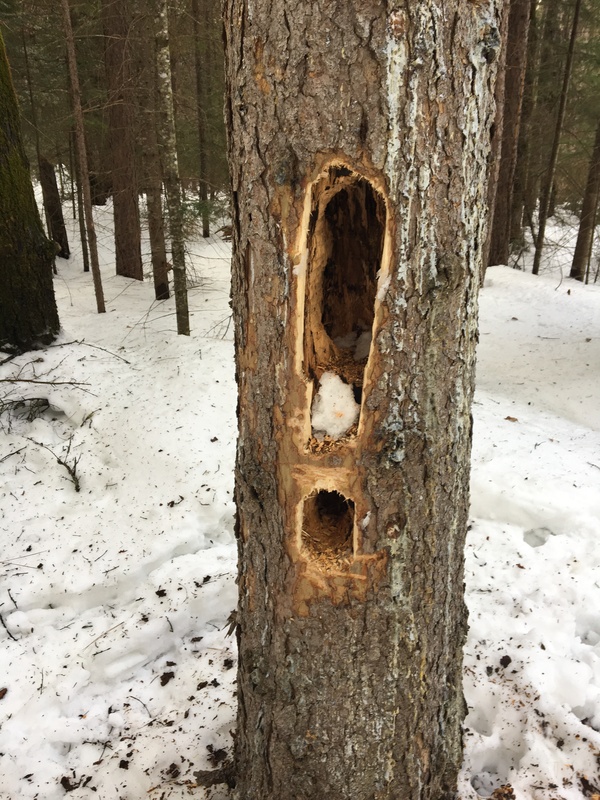 A woodpecker has made quite a mess out of this tree I spotted along the trail. The cadge crib was covered in snow and I couldn’t really see much of it so I moved on the the alligator. 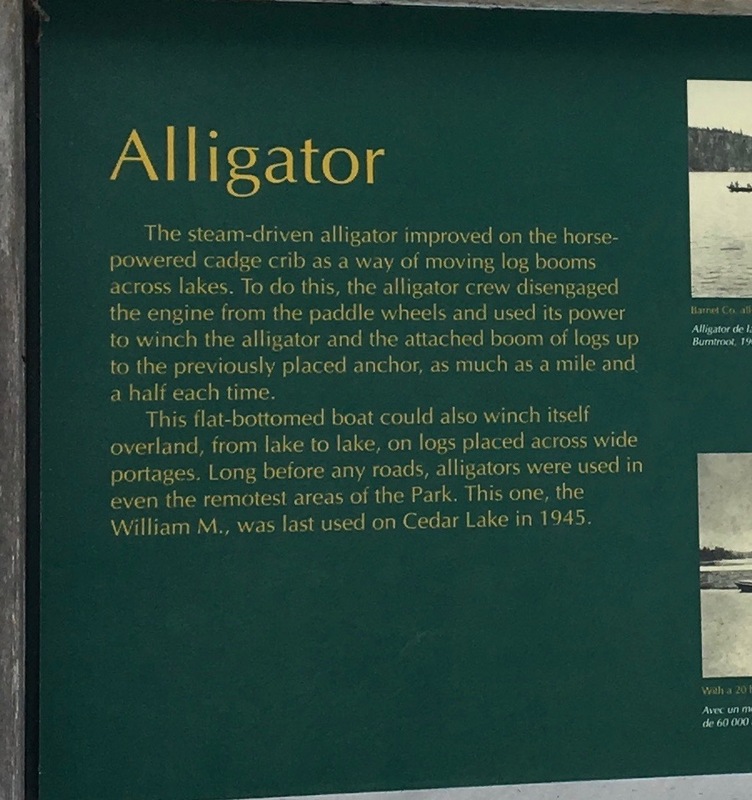 It was steam driven and improved on the horse-powered cadge crib as a way of moving log booms across lakes. The flat bottomed boat could also portage itself. Pretty amazing stuff! This trail is really pretty and informative. I can just imagine how lovely it must look without the snow, walking on this trail beside the water. The Pointer showed above is a famous river driving craft that was created in the 1850’s. They enabled three generations of river drivers to work in dangerous white water. 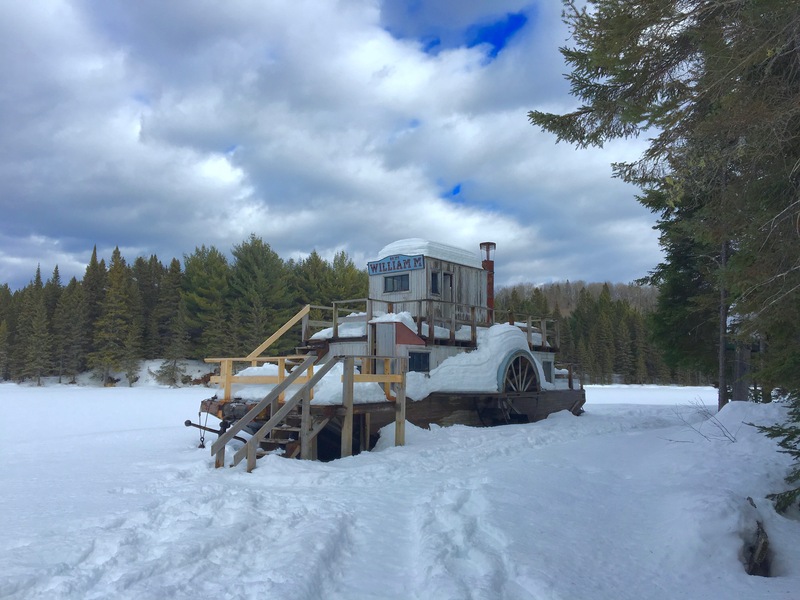 This is the log dam and chute, although somewhat frozen, you can get a good idea of how it all worked. This helped sustain the water so the logs could be driven down the river past the rocky section below the dam. Many river drivers lost their lives while working. Their caulked boots were nailed to a nearby tree and their bodies were buried beside the rivers which had killed them. I stood looking at the cross thinking of all the people who were killed logging and thought how sad it was. These people were working to make a living and risked their lives every day. So different from the times we live in now, where we have safety regulations and laws that would keep something like this from happening. RIP river drivers, you were a brave bunch. 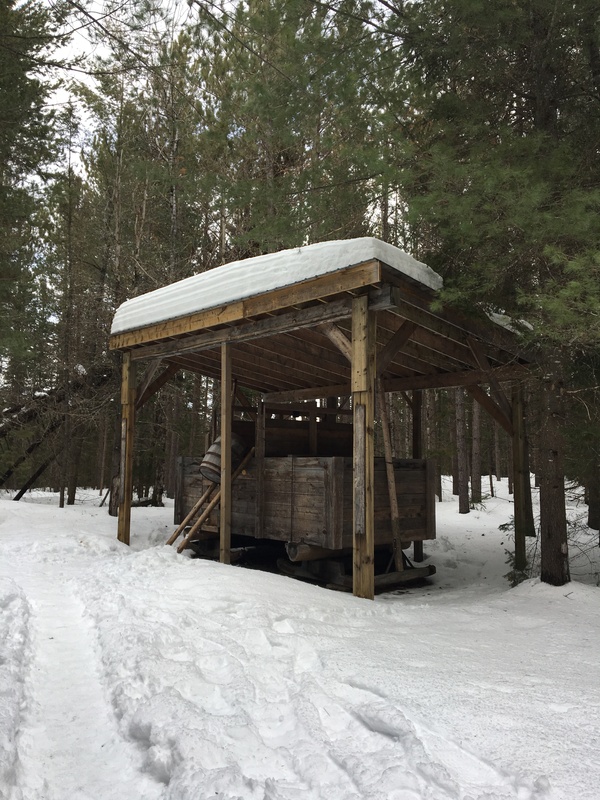 Next on the trail is the saw log camp. I just love looking at all these old buildings and some had tools and items that were used during those times. So neat to share this with people so they can learn about the past and actually see how things were done. 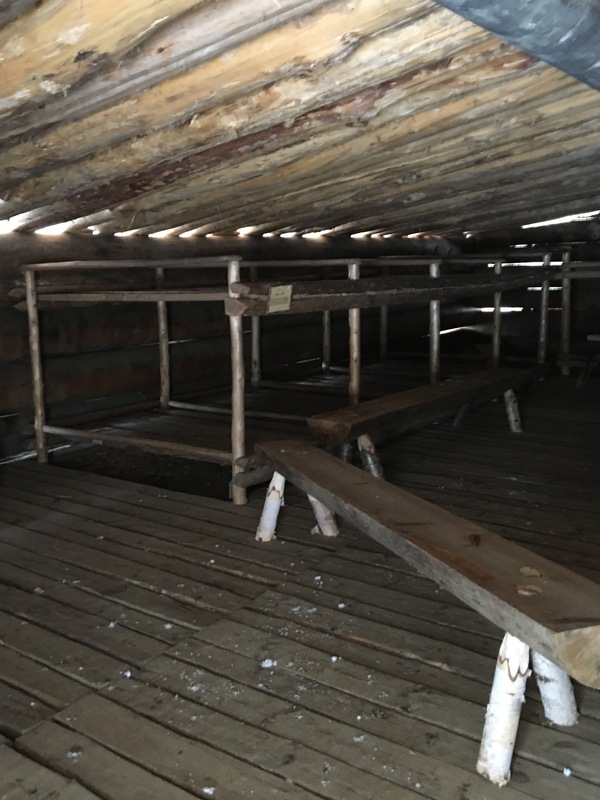 This was another building where people would sleep at night. 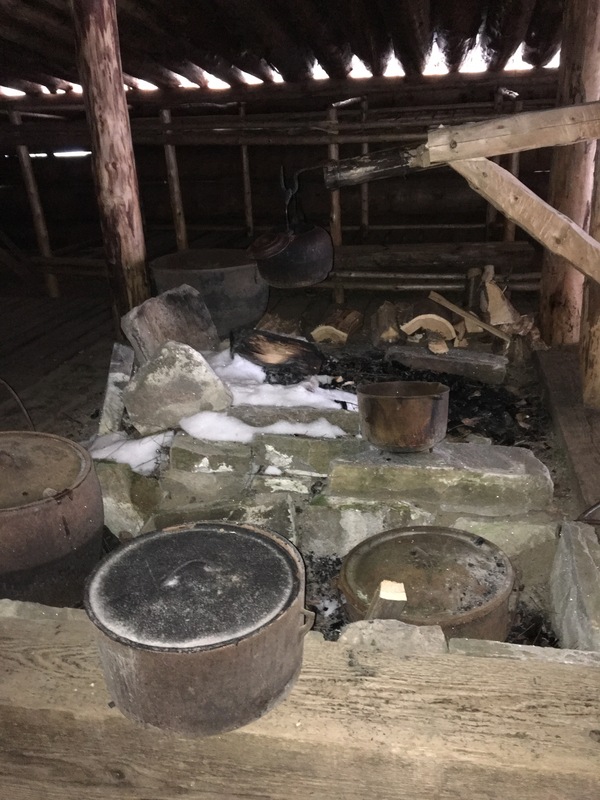 Unlike the shanty at the start of the trail, however, there was no cooking area in the center, just a very small wood stove that was used to heat the building. I was quite amazed seeing this along the trail. Eventually the horses started being replaced by automobiles. 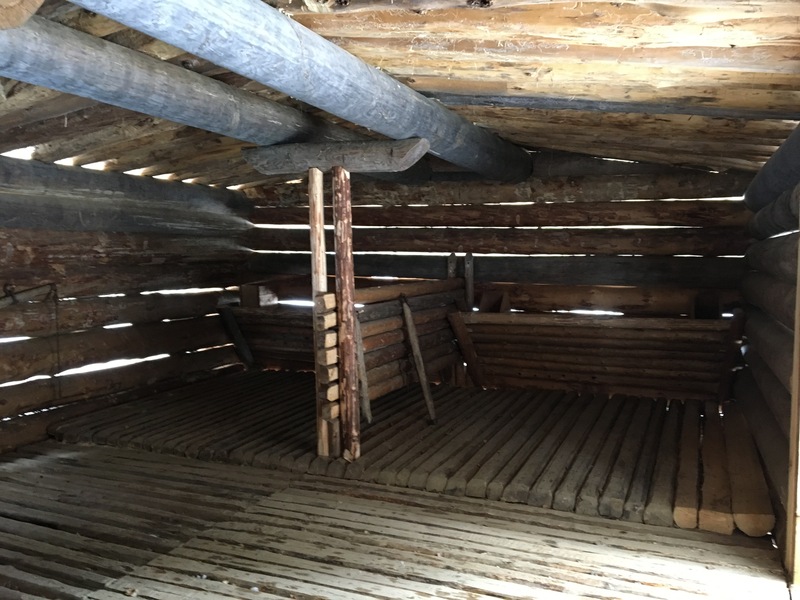 The truck shown above would pull the sled behind it full of logs. I was pretty surprised that the truck shown, would be able to pull so much weight behind it, and not pull something on wheels but a sled? Must’ve been one very powerful truck! 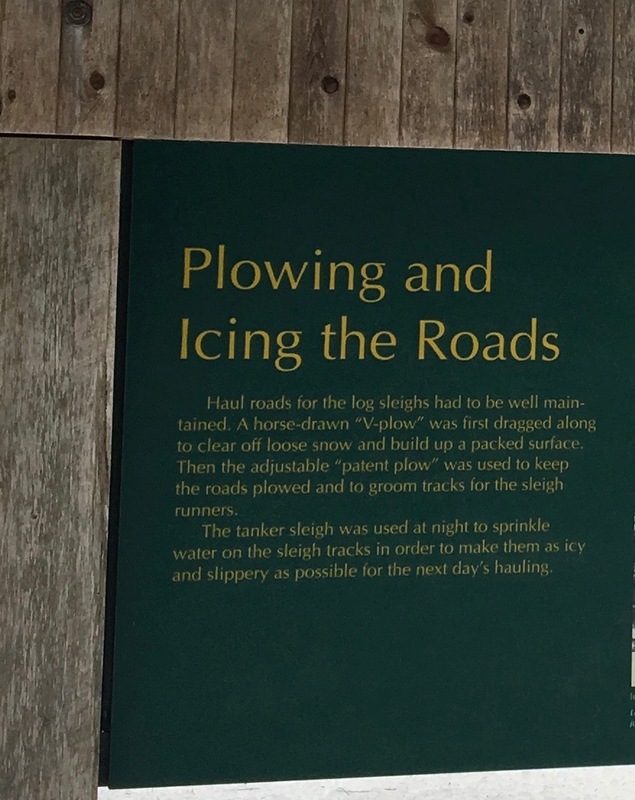 As the trail moved along, so did the years and more and more technology was present with automobiles, tractors and trucks being used in the logging industry. And then they even moved on to trains. I loved that every display had a plaque to give you information and background into what you were looking at and how it came into play in the overall picture. So informative. The last two buildings are usually open to viewing in the warmer months, but sadly I didn’t get to look inside them today. I will definitely have to come back. 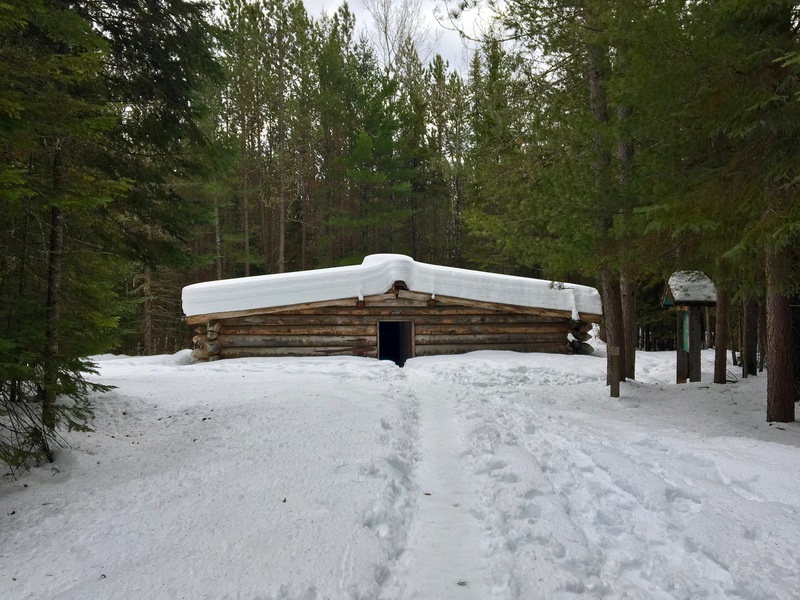 I hope you enjoyed this weeks post on the Algonquin Logging Museum and take some time to visit it yourself soon. Thanks so much for checking out my blog. If you have any questions, comments or just want to say hi, please leave a message. Thanks so much Ron. This post is actually from February 2017, but I am getting out a tiny bit, not too much still yet. Still recovering unfortunately but getting there. Thanks for the comment and for checking out my post! Cheers! Finds like this are why I never plan trips with a definite ending date, LOL Nice job explaining things! 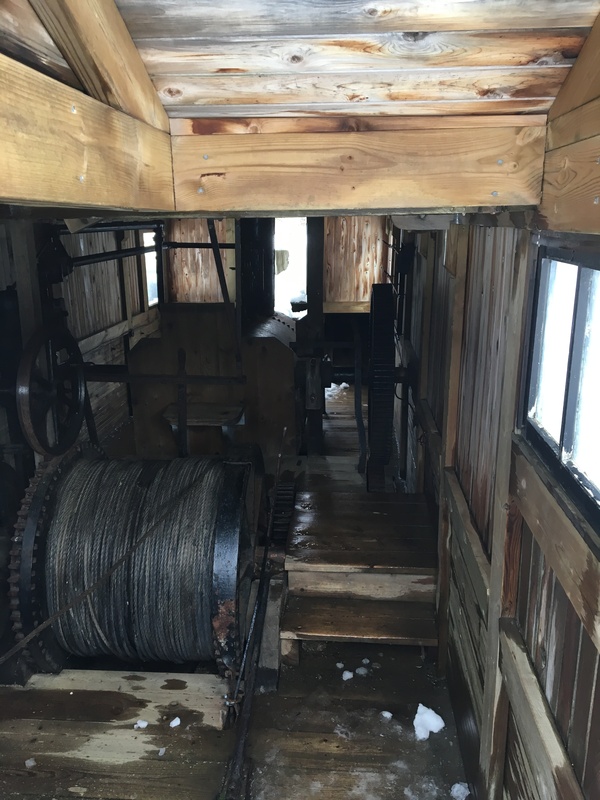 They really did some amazing things to move logs to market, rerouting rivers, lock dams, steam tramways and trains later left to rust because it was too expensive to haul them out of the woods. Wars were fought over access to the rivers for transporting logs, villages grew then disappeared as the forests were cut, but in the end, the waterways are much the same as they were 200 years ago. Hey George! thanks so much for the great comment and for checking out the post. I’m so glad you enjoyed it and participated in it by leaving such excellent information. I was pretty surprised by all the cool things they did way back then. So amazing. The furthest we have been on the highway through Algonquin is Mew Lake, we tend to stay east of it, just for travelling time. One day we will have to explore the west side of the highway. The logging museum would be interesting.